We begin with easier (but much less versatile) ways of drawing a rectangle without shaders. The easiest way, if you want a uniformly coloured rectangle, is to use the glRectf procedure as in this example. You could instead put the vertices into an array as demonstrated in the following shader example. This example is based on our Smart Pascal WebGL demonstration. You can download the dglOpenGL unit from this English page on the Delphi OpenGL Community wiki. The code of the unit and of the form follow a screenshot of the output. The second example, which outputs a rectangle with gradient shading, has error detection code that is useful for eliminating errors. // If vertex shader did not compile, show a message and exit. 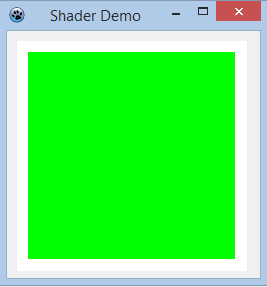 // If fragment shader did not compile, show a message and exit.